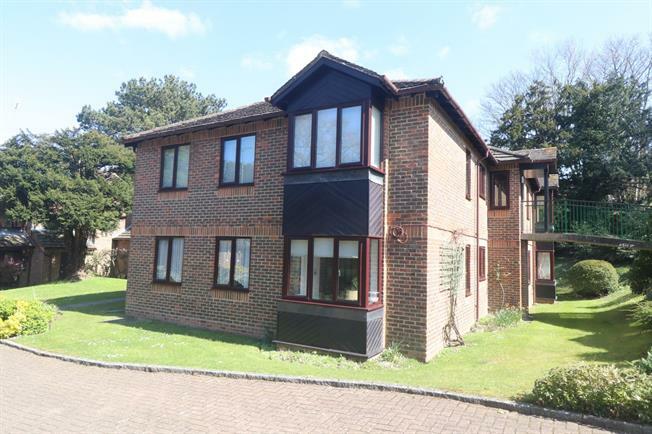 2 Bedroom Ground Floor Flat For Sale in Caterham for Asking Price £230,000. This smaller and more established retirement development is situated slightly further from the town centre' making it particularly suitable for those wishing to retain their independence. This two bedroom, ground floor property features a double bedroom, second bedroom and double aspect lounge as well as a fitted kitchen. The bathroom has been refitted with a walk in shower. The property features double glazing and electric heating and is there are communal gardens, a conservatory and residents parking. Two useful storage cupboards and airing cupboard. Doors to bedrooms, lounge bedrooms and shower room. A double aspect room overlooking the communal gardens with bay window. Door to kitchen. Fitted with a range of base and wall cupboards and fold down breakfast table, space for appliances including washing machine. Window overlooking the gardens. Front aspect double bedroom with built in wardrobe. Refitted with a white suite comprising walk-in shower, low level WC and wash hand basin. Within Roseneath Court there are a number of facilities for the residents including a conservatory, a laundry, pretty gardens and parking. There is a visiting house manager that overseas the day to day running of the block.